US: President Barack Obama lauded George W. Bush Thursday as resolute in the face of terrorism, putting ideology aside at the opening of a library which makes his predecessor's case for history. With all living US presidents at his side, Bush admitted some of the choices he made were unpopular, but said he was driven by a mission to spread freedom, in two tumultuous terms marked by the Iraq war and the September 11 attacks. The dedication of the 226,000-square-foot library, museum and policy center in Dallas put a capstone on Bush's political career, and it will now be left to historians to debate his controversial legacy. Obama, who had flagrant foreign and economic policy disagreements with Bush, chose instead to highlight the 43rd president's character, and spoke of a special bond with one of the few men alive who sat in the Oval Office. “He's comfortable in his own skin. He knows who he is. He doesn't put on any pretenses ... he is a good man,” Obama said. He remembered how Bush steadied a nation traumatized by the September 11 attacks in 2001 and began to plot the US response. 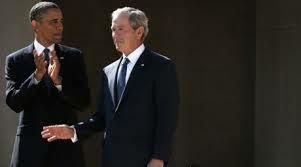 “We're reminded of the incredible strength and resolve that came through that bullhorn as he stood amid the rubble and the ruins of Ground Zero,” Obama said, and also thanked Bush for his counsel when he became President. “No one can be completely ready for this office,” Obama said. “But America needs leaders who are willing to face the storm head on. That's what president George W. Bush chose to do.” Bush, who led from 2001 to 2009, wiped away a tear as the tributes rolled, in a ceremony lent added poignancy by the frailty of his father, and fellow ex-president, George H.W. Bush, 88. “There was a time in my life when I wasn't likely to be found at a library, much less found one,” Bush, 66, quipped in a reference to his wild youth. But turning serious, he made an impassioned case that his controversial policy of pre-emptive war and regime change in Iraq was born of principle. Like Obama, former Democratic presidents Bill Clinton and Jimmy Carter chose to skip over controversy and praised Bush for battling AIDS in Africa.